When I talk below about the first deck of any type, it is in fact the oldest deck of which I know that copies survived time. Card decks are used for playing. Cards get lost and paper wears out. When decks could not be used anymore to play with, they were thrown away. This is one reason why copies of old decks are rare. And this is especially true in France, where on the 19th October 1701, the King Louis XIV (the Sun King) instaured a taxe of 18 deniers on all card decks (including Tarot decks) and ordered the destruction of all existing woodblocks (except under certain conditions those who served for making Tarot decks, called Tarrot in the text) for card printing. Actual stocks of cards could be sold until the end of the year, after that date all new cards should bear the taxe stamp. A copy of this royal decision is conserverd in the French National Library and can be found on their wedsite on the address http://gallica.bnf.fr/ark:/12148/btv1b8602065h/f1.image. To avoid paying this taxe, special export versions were produced, sometimes under fictive names, like the Tarot of Jean Dodal that was probably produced by Jean Payen. Apart from these differences, the cards look a lot alike. Many typical scenes for the Marseille Tarot cards, like the Lovers, the Chariot and the World are also present in the Tarot of Jaques Vievil, although differences in details exists. Except for the more developed floral decorations on the Vievil deck the pip cards are very much the same and also the figures on the court cards have almost the same (but mirrored) poses. It seems evident that both decks are tapping from the same source of inspiration. The difference in style is because Jaques Vievil and the first designers of the Marseille deck (like Jean Noblet in Paris and Nicolas Rolichon in Lyon) probably did not simply copy older decks, they where partly inspired by the same source and partly by other sources. Apparently Jaques Vievil had access to a Bologna deck. Because the Italian decks were not numbered he misinterpreted at least one of them. His Moon is almost identical to the Sun on the Bologna deck. As a result Noblet and Vievil created different decks. Having accepted that the Tarot of Jaques Vievil and the Marseille Tarot are using at least partially the same sources of inspiration, the question is now, what were these older sources, where and when were they created? Let us go back to the cards found in the well in the Milanese Sforza castle, mentionned on the page about the transition period between the Italian Trionfi cards and the Marseille Tarot. Most cards are dated to the 17th or 18th Century. The cards dated to the 17th Century have a same style of card back as the 1600 Tarot of Bologna mentionned on the same page. Two cards can be recognized as trumps (the World and the Sun), ten fragments can be recognized as court cards and the remaining 30 fragments belong to pip cards. The first person reporting about these cards is a certain Novati in an article that appears in 1908 in the “Bulletino dei Civici Musei Artistici ed Archeologico di Milano (Anno III)”. The next year he publishes another article about the cards in the journal “Il libro e la Stampa”. The articles are mentionned in 1966 by Gertrude Moakley in her book about the Visconti cards and in 1980 and 1981 by Michael Dummett in a series of articles in “the Journal of the International Playing-Card Society”. Finaly Stuart Kaplan reports about the cards in “The Encyclopedia of Tarot, part II” on the pages 289 to 296. Kaplan shows photo's of all 42 fragments with Italian suit symbols, he does not show the cards having French suit symbols. The oldest fragments can be dated to the end of the 15th Century and the youngest ones seems originating from the 18th Century. The cards belong to many different decks. The cards are placed in eleven groups, from the probably oldest cards to the maybe youngest. Group I consists of only one single card, a Two of Coins card, with a size of approximately 48 x 93 millimeters. It looks exactly as the Two of Cups of the Marseille Tarot (see the figure here below). On the banner, linking both coins together, is written PAVLINVS ….. CASTEL.....TO FECIT 1499, where the points replaces unreadable characters. The back of the card does not show any pattern. According to the research of Novati, around 1500 there lived a card maker in Milan who was called Paolino da Castelletto. References have been found to him dating from 1494, 1508 and 1513. It is very plausible that this card was produced by him. Remember that the French King Louis II d'Orleans took Milan in 1499 and 1500, and that his army stayed there for several years. Very probably copies of these printed cards went to France with the returning French troops. We remark that except for the floral decorations, who are different in every deck, the cards are very similar, including the way the coin symbol is represented. The main difference is that in the Tarot the Marseille (the 3 cards at the right side), the scenery is mirrored with respect to the older cards (Sforza castle and Vievil). We will look a little bit closer to the reason for this mirroring when we deal with the internal structure of the Tarot decks. The next card is a fragment, it seems that the card has been ripped in two parts before it was throw in the well. We can recognize the illustration as the King of Cups (the person is sitting and has a cup in one of his hands). The card has a width of 57 millimeters. In comparing the style of this card with other known cards, it has been dated to the end of the fifteenth or the beginning of the sixteenth Century. In the next figure we compare this card, again with some TdM style cards. The cards presented are from the decks of Jaques Vievil, Jean Dodal and Nicolas Conver. Again we see the same mirrored position of the cup in the hands of the King. Vievil has another position for the feet, but on the The Marseille Tarot they are clearly the same but again mirrored. The fragment looks more similar to the TdM cards than when compared with the card of Vievil. In the above figure the 9 of Swords from two different decks, one with the God of War Mars on its back side and the other with the Goddess of Spring Proserpine. Remark that on the card of the Mars deck the ninth sword is pointing downwards and on the Proserpine deck upwards. Five other cards are also odd numbered Swords, and we remark the same variation. Three times the last sword is pointing downwards and two times the last sword is pointing upwards. On the Cups and the court cards, the right side is always up. Another group of six cards is again dated by Novati to the 16th Century, but Michael Dummett has arguments to date them to the 17th Century. The cards have a typical Italian format, with the height twice the width, 68 by 135 millimeters. All cards are apparently from the same deck, with on the back Cupido (without a blindfold) shooting his arrows at the hero Ruggiero standing in front of a naked Angelica. This story was part of the poem Orlando Furioso, written in 1516 by Ariosto. The most interesting card is a trump card, the World. In the same group as the World card, there are five numbered cards, the five, seven and nine of swords, the six of coins and the eight of batons. The cards are again in every detail identical to the decks from Jean Payen and Jean Dodal. Especially the deck of Jean Payen is identical in the slightest details. There are differences in the floral decorations with all other TdM style decks. The only difference between the deck of the Sforza caste when compared to Payen and Dodal is that on the TdM decks the swords and batons have numbers written on the side of the cards, on the eight of batons the number even replaces the floral decoration. It seems very probable that the cards from the Sforza castle are older than the Type I Marseille cards and that a copy of the same deck as has been found in the Sforza castle has served to created this specific TdM style. The cards from the groups five to ten are all very to the TdM decks but different in details. Group 6 has five cards from one single deck, with a size of 64 by 117 millimeters. There are one court card and four pip cards. The pip cards (swords and coins) are all numbered but the Seven of Coins is spelled IIV and the Six of Swords IV. On the back of the card small crosses patée. The court card is the Knight of Swords the looks closely like the last generation of TdM cards, but it does not have its name mentioned on the card. Kaplan writes that the deck is probably from Bologna in the 18th Century. The cards in group eleven have a size of 61 by 110 millimeters. There are one trump card (the Sun), one court card (the knight of Cups), and one pip card (the Four of Batons). The back of the cards have the same diamond shaped structure as is typical for the French decks at the beginning of the 18th Century, for this reason Dummett attributes the deck the same age. Again, although there are differences in details, the cards have many features very similar to the decks of Rolichon, Dodal and Payen. The Sforza castle is not the only source of old printed decks. The so called Cary sheet, dating from approximately 1500 and conserved in the Cary Yale Library, has also many features in common with the Marseille decks. The Seven and Eight of Batons are identical to the Marseille pattern, and the many Trumps appearing on this sheet have many points in common with the Marseille Tarot. 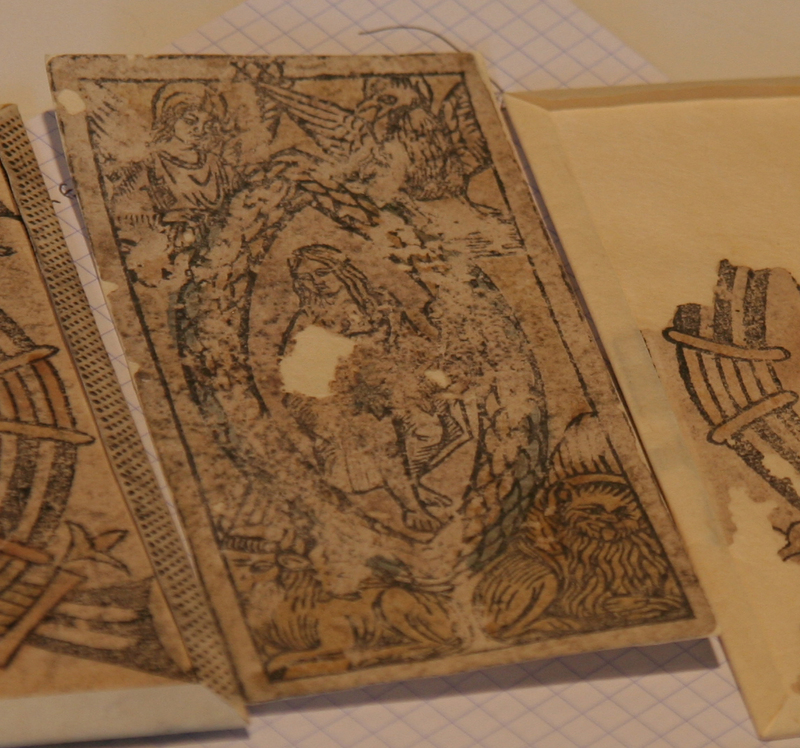 In the next figure some of the cards belonging to the Cary sheet, an uncut sheet found inside the cover of an early 16th Century book compared to the deck of Jean Noblet, the oldest Tarot deck with the Marseille pattern. Six cards on the Cary sheet appear complete, the Popess, the Emperor, the Empress, the Moon, the Star and the Conjurer (Magician). From fourteen other cards only fragments are present. The sheet is dated to +1500. Although not identical, the trump and pip cards have a strong resemblance with the Marseille Tarot. Some cards are different, like the Devil, but the basic structure is there. We also remark again that some cards are mirrored with respect to the cards of Jean Noblet. The conclusion is clear for me (but who am I? ), the Marseille Tarot has its roots in Northern Italy, it is definitely not a French invention. Similar patterns as we find later on the French Marseille Tarot, existed already some 150 to 200 years before Jean Noblet in Northern Italy. In fact, it was and still is a standard Italian pattern. Not all cards we found in the Sforza caste are that old, but they fill important gaps between the handcrafted Trionfi decks and the printed Marseille Tarot, and most important of all, they are a very convincing evidence for its Italian origin.